When it was announced that Still Game would return to the telly for another series after a 9-year hiatus, it was almost too good to be true. The trials and tribulations of Jack and Victor and the Craiglang crew made for the pinnacle of Scottish comedy over its six year run and the little vignettes of life in Glasgow made for some of the best individual episodes of TV that I’ve ever seen. Season 7 of Still Game was pretty much the perfect summing up of the two grumpy old men that drive the show, still full of wit and character but getting on a bit in years too. The heart and soul of Still Game was always the traditional Glesga patter between the locals of Craiglang, and the humour that ran through the show of ridiculous situations playing out among the most ordinary of people. All of this was made possible by tremendous writing to capture witty jokes, absurdist plot lines but also a touch of emotion that wrapped things up nicely. This series delivered on all of these in their own special way, which is what made watching these new adventures unfold such a pleasure, but it wasn’t all smooth sailing down the Kelvin. For me the first episode struggled to find the rhythm that made Still Game the show it was. The jokes felt a little laboured and the show seemed to try a little too hard to recapture the feeling that made the old episodes so good. There was always going to be a bit of that – with writers Ford Kiernan and Greg Hemphill toeing a fine line between rehashing what they did before and writing something alien to the legions of fans tuning in every week. But as the series went on the show felt surer of itself and took on the new world the characters found themselves in. In particular, the second episode “The Undrinkables” where the cast and characters paid tribute to the late Jake D’ Arcy who played the wonderfully named Pete the Jakey. This showed the skill of the show in its’ truest form – managing to bring laugh out loud moments, new and memorable characters, and a poignant and touching memorial all into one thirty-minute show. From there the series picked up and had more and more of the trademark moments that define the show. For me the best stint was in that very episode where Jack and Victor investigate the local bootleggers, and proceed to break into and smash up the suspect’s kitchen only to find Tam and his wife celebrating their anniversary in a little less peace than hoped. The writers also made the smart move of bringing in more guest stars into the show in this series to freshen up the cast and provide some new perspectives on the lives of the main group. Characters such as Methadone Mick and young Fergie show there’s new blood in Craiglang (and Scottish comedy too) and it was good to see some new faces and new gags along with the old crew. Still Game continues to mark the best comedy show that BBC Scotland has to offer, with Ford Kiernan and Greg Hemphill surely being two of the finest writers in the Britain, let alone Scotland. 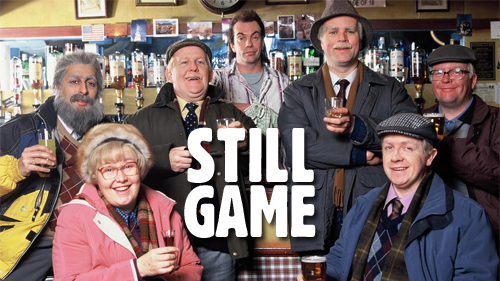 All-in-all Still Game’s return was a success both in terms of quality and in terms of viewership and a fantastic effort from the writers and cast in doing their best in meeting the impossible expectations of the fans. Here’s hoping it’s not another 9 year to get another helping of the finest show BBC Scotland has to offer!